Our client was faced with a situation that required a complete remodel of a pre-existing, smaller than average deck, which was in poor condition. 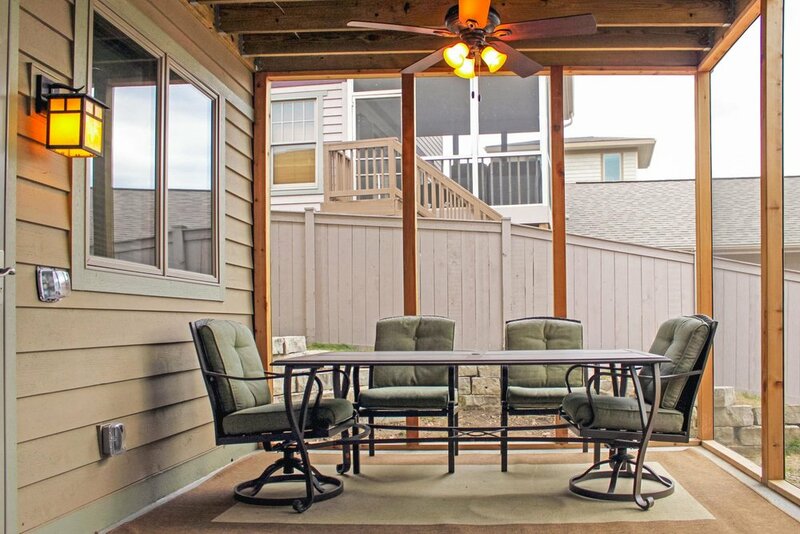 Their desire was for us to add a screened porch…one that would actually keep the bugs out. Our client asked us to come up with an inventive solution that would provide a new porch. One design challenge that we had to overcome was the roofline. After exploring sloped roof and hip roof options we chose to install a at roof. The angle of view that most people observe the space from in the alley does not reveal the difference between the at roof and hip roof of the house to a noticeable extent. It looks good and integrates well into the design, as the eave line was continued to achieve this illusion. This addition is a Wisconsin Builders Assocation Badger Craftsman Award winning project. An alley garage which enters on the lower level, and main level kitchen and living spaces led us to the solution of creating a two-story porch. This uniquely designed two-story porch serves different purposes on each level. The upper level is enclosed with vinyl porch enclosure windows, which creates a barrier from the wind and rain allows the space to be used for three seasons. The lower level is a screen porch that is protected from moderate weather conditions. A winding staircase was added not only for aesthetic appeal, but also to provide access to the lower level. The staircase also acts as a window well, allowing light into the lower level laundry room window. The footprint was expanded as far as possible without making structural modifications to the garage trusses. It is satisfying to report that this project was awarded the Wisconsin Builders Association Badger Craftsman Award for a Room Addition Under $75K in 2015.